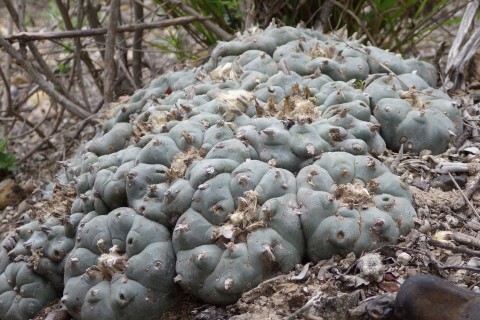 An unusually robust Lophophora williamsii in South Texas today; seen in mid-March 2016. This plancha is the product of intact growth rather than regrowth. 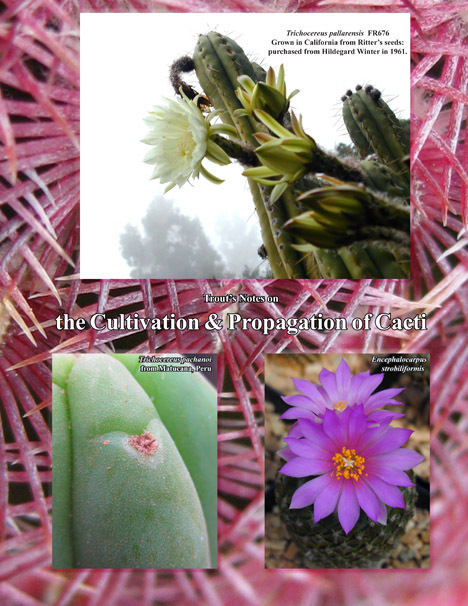 As a hint of things to come, the above is a recent photograph of the same plant as graced the front cover of Sacred Cactus Part A (below). It was nice to see it was still faring so well. Many more images of this cactus species and also multiple other species of cacti and assorted desert plants are in the process of being readied for addition to this webpage and the appropriate pages at www.CactusConservation.org. Despite a bewildering series of last-minute camera battery, SD photocard & microdrive failures, culminating with my best camera dying on the first day of good shooting in the field, a lot of nice images were acquired that will soon be appearing on all three websites. It might not look like we’ve been doing much here or at TroutsNotes.com this past year. In reality both of those websites have seen much work this year although very little is being dated as new work so as to not disrupt the way WordPress organizes new posts. This project still links to PDF versions of what currently exists while work proceeds to bring those portions of the remaining newer material online here. This page is a portal page for all four volumes, with a bit of history about the book. One comment might be helpful starting out. This book was created as part of an attempt to create some actual reference material that appeared to be sorely needed by researchers working in this area. It is therefore likely to be found far more useful by those people who already have some sort of a basic educational foundation in biology and chemistry than it will be by complete newbies. I apologize for that but it was not intended to serve as introductory literature. There are many great information sources available online for novices. Erowid is my favorite resource but Neurosoup also has a lot of good pieces online that can be very helpful for newcomers wanting to gain some familiarity with the subject material. I’m also open to and welcoming of suggestions as to ways to make THIS material more accessible to all levels of readership and interest. Thanks for any input and feedback! To access Part A, click on the image of the book cover or the link that is following it. Please enjoy the PDFs in the meantime. 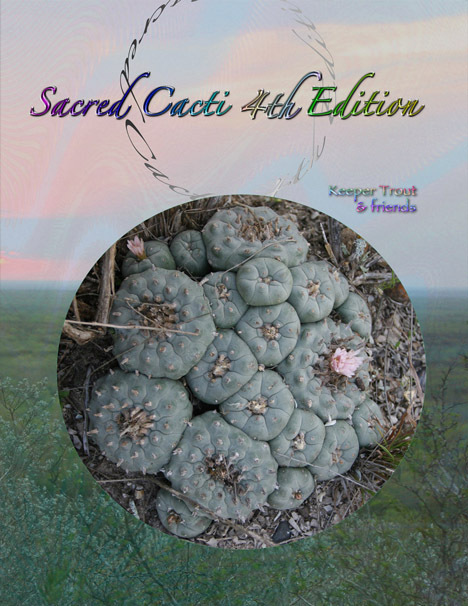 As you no doubt gathered from that, the book Sacred Cacti 4th edition is moving along well in the process of coming to this website. It will no doubt begin with some false starts as I determine how best to present a large and heavily illustrated reference work in a WordPress environment. Almost all of that work is already online and accessible through the table of contents that can be reached using the links located on this page. The former Appendix A was itself expanded into two books that are already available as PDF files. 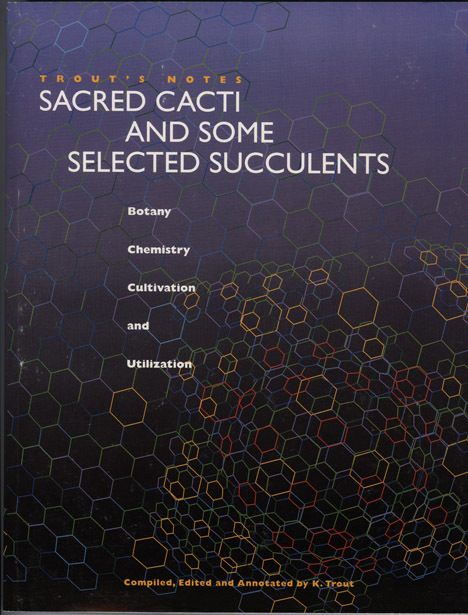 Sacred Cacti similarly divided into several books due to the separation of the Trichocereus material to form the San Pedro book, leaving The Mescaline Containg Species, and also two smaller books, Cactus Cultivation and Some other Succulents. Three of these titles are presently available as separate PDF files. If someone wants to pay me for them, Thank-YOU! It is hugely appreciated and very helpful to aiding the creation of more and similar work. Against the good advice of those very sane-thinking friends, I decided though that requiring payment for access adds a restrictive bottle-neck to information being accessible to people who might actually need it. Additional chapters are also already available online or exist as PDF files or are coming as webpages or more PDF files. Their content and the remaining material will continue being added to this webpage. They are all copyrighted so, please, send people here instead than distributing them. Above on this page is a link to Table of Contents for Part A with links to the contents. 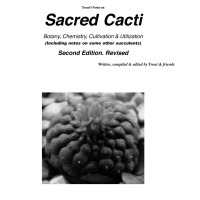 This page will no doubt see rearrangement of its contents in the future as the book Sacred Cacti 4th edition materializes here but the URL will remain stable. 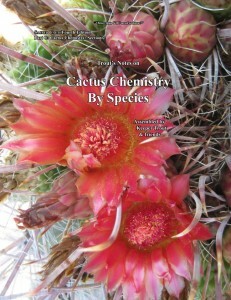 The end goal is to have Sacred Cacti 4th edition online in its entirety. At the beginning I am using links to the PDF files to provide some accessibility to the contents while this web project is being completed with the abundant new materials. Considering how much new material and old literature acquisition has occurred and the resurgence of new research work worldwide, the web has probably always been the logical place for this expanded idea of a “book”. 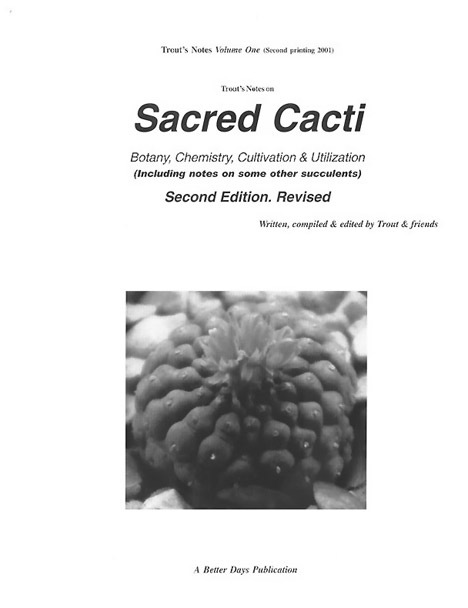 I am anticipating that, when completed, the four volumes of Sacred Cacti will include close to two thousand pages of print (if it was on paper) with more than six thousand photographs. The latter makes the internet an especially nice medium. Five GBC-bound copies of this work were distributed during 1996. One of those, in the hands of Leo Mercado of The Peyote Foundation, is what caught the attention of Narayan Publications who graciously designed a cover, added some strange words from Gary Kroger to the back cover, took it into perfect-bound print and released it at the first Mind States conference in Berkeley in 1997 just in time to coincide with the hundedth anniversary of Arthur Heffter’s discovery of the activity of pure mescaline using human bioassay. There was one minor fly in the ointment, this entire book had been formatted to save paper during the editing process (some of us still edit much better with words on paper) and a communicational gap led to that not being corrected prior to printing and binding. Imagine reading a book set in 9 pt Times New Roman with subsized margins formatted into two columns per 8×11 page in a landscape orientation. I humbly thank not just Lakshmi & Gary but those 200 book owners for their love of the material; especially considering it came despite their certain ordeal in reading it. Second edition was produced in black and white. It saw two printings. The first in 1999 was 422 pages and lacked illustrations. The 2001 printing was 424 pages that saw minor revisions and updating but added some black and white images. Fourth edition is also in color; greatly expanded and thankfully corrected and updated. It has already begun the process of appearing on this website in its entirety. The entries in “Part A” can be found linked to at the bottom of the page. In 1999 & 2001 the contents were still all as one book; with a few b&w images. 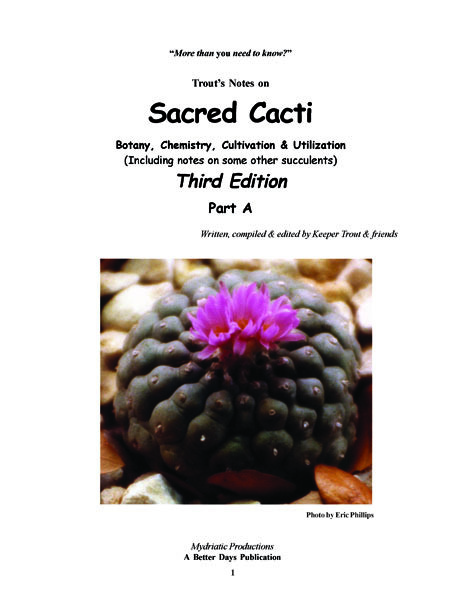 Sacred Cacti began as two volumes; Sacred Cacti & Appendix A. 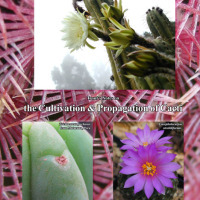 Several chapters within it including the chapters on the Cultivation & Propagation of Cacti and the cactus alkaloid summary by species, were produced as stand-alone fold-and-staple booklets during the time Sacred Cacti was being produced. Some of the larger chapters such as The Mescaline Containing Species were produced in a GBC-bound format in 1996 and beyond. 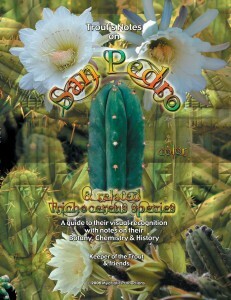 When it went to a third edition in 2003 and became a full color book, the material had grown so dramatically that part of that one chapter as concerned the Trichocereus species became a stand-alone book retitled San Pedro & related Trichocereus species. It was always a full-color book but it had to be printed in b&w due to my having inadequate production capital for color production. I am very grateful to Mark & Robbie for their backing making this book a reality. 2. 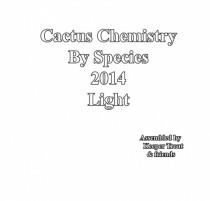 Cactus Chemistry By Species. Originally Appendix A covered only the alkaloids reported from the cacti that had been additionally reported to contain mescaline and included a few of the Coryphantha alkaloids (i.e. 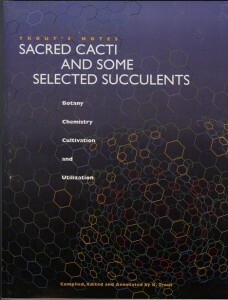 detailing only the cactus alkaloids reported within the cacti discussed in Sacred Cacti). 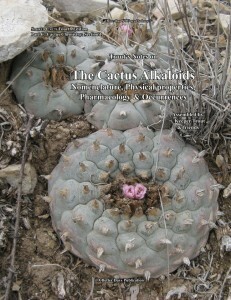 During the separation of Appendix A into the books The Cactus Alkaloids and Cactus Chemistry By Species it was decided the Cactus Alkaloids would be expanded to additionally incorporate and cover all known cactus alkaloids including phenethylamines, isoquinoloines and imidazoles. 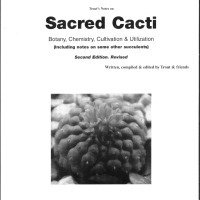 In 2013, The Cactus Alkaloids was made complete with the addition of several chapters formerly within the pages of the main body of Sacred Cacti: specifically the chapters concerning mescaline, its pharmacology, toxicity, assays and useful reagents. [3 Dec. 2013 PDF 27.7 mb] 384 pages with 80 color photographs. 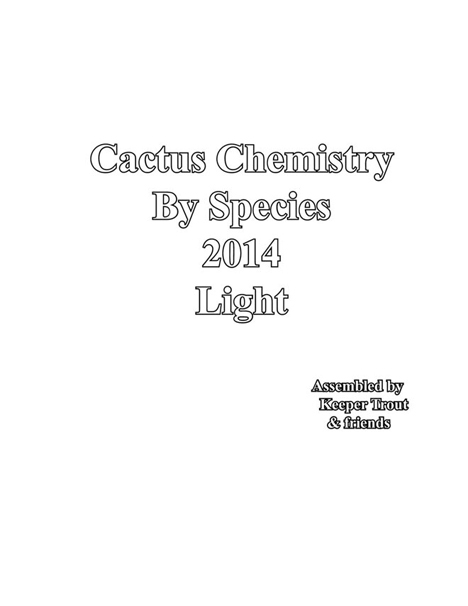 Cactus Chemistry By Species has been the most complete and comprehensive summary detailing the published analytical accounts for the cactus species since its first publication as a stapled booklet, in 1996, under the title “Distribution of the Alkaloids & Triterpenoids Reported in Cactaceae; By Species” and the following year incorporated into Appendix A of Sacred Cacti‘s first edition. During 1997 and 1998 this was offered alone and also as a part of Appendix A. It was retitled in 1999, separated from Appendix A and produced as a perfect-bound book. A more recent Activity & Mythology section was created to discuss the wealth of ethnomedicinal applications and pharmacological studies, the abundance of published errors, misidentifications & misconceptions, urban (or rural) legends and some scientific myths. The 2013 revision (now 674 pages) added more than 1500 color photographs. Photograph-free version of the above to enable easier use during research work.